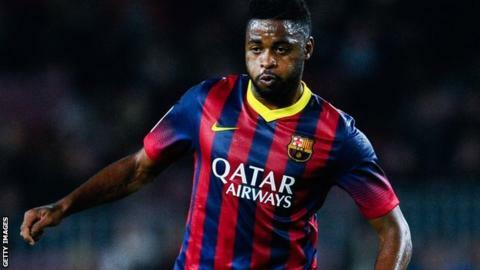 West Ham have signed former Arsenal midfielder Alex Song on a season-long loan deal from Barcelona. The 26-year-old Cameroon international, wearing a Hammers shirt, was introduced to home fans before Saturday's Premier League game against Southampton. "I think the club has very good ambition and I hope we can maybe catch the European positions," he said. Song joined Barcelona in 2012 from Arsenal for about £15m with an 80m euros (£63m) release clause. He played 206 times for the Gunners between 2005 and 2012 and has made 39 appearances since moving to the Nou Camp. The Hammers indicated they fought off interest from "some of Europe's biggest clubs" to seal the deal. And Song said he was impressed by the ambitions of the London club, which will move from the Boleyn Ground to the Olympic Stadium in time for the 2016-17 season. "I need some games to be ready and get my fitness back," he said. "When I am 100%, I will bring the experience and I will make the fans happy, I am sure. I am lucky to be back in London, back in England and with West Ham. I am looking forward to showing everyone what I can do. "West Ham is looking to be a very, very big club in the future. The club has a great project and it is a very big project with very big ambition." Song is West Ham's eighth summer signing, following the arrivals of Mauro Zarate, Cheikhou Kouyate, Enner Valencia, Diafra Sakho, Carl Jenkinson, Aaron Cresswell and Diego Poyet.